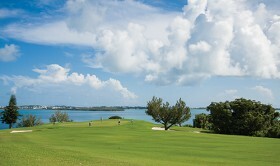 On Friday May 22nd, The Tucker’s Point Club will host Bermuda’s inaugural qualifier for the World Corporate Golf Challenge [WCGC]. Over 40 countries will participate in this year’s international event, with finals being held in Cascais, Portugal from June 30th to July 5th. Founded in 1993 by two English, professional football players, the WCGC has grown into, arguably, the most established, global Business-to-Business golf tournament in the world. Executives from around the world compete in their local clubs and regions to represent their country and business in a 5 day event featuring the Finals, a separate Corporate Cup match, networking events, excursions and a gala dinner. The finals are televised in over 60 countries and shown on 14 international airlines through their inflight programs. Renowned golf coach Simon Holmes will be the Official Final Golf Coach and will offer tips on the driving range and course for competitors, guests and sponsors. Adidas, BBC, Barclay’s Bank, Coca Cola, Merrill Lynch, Ford, Microsoft and Rolls Royce are just a few of the more than 100 companies that have been represented at the WCGC. Companies that are listed in Bermuda and would like to participate, are invited to register for the Bermuda Qualifier by calling Robert Holland on 298-6909 or emailing at robert.holland@rosewoodhotels.com. Tucker’s Point To Host WCGC Golf Qualifier!!! Bermuda is already known for countless sports events but golf is an event that touches many around the world and will continue touching many more with advertisements such as: “The finals are televised in over 60 countries and shown on 14 international airlines through their inflight programs.” Renowned golf coach Simon Holmes will be the Official Final Golf Coach and will offer tips on the driving range and course for competitors, guests and sponsors. On behalf of countless Bermudians, I take this opportunity to thank Tucker’s Pt. and to anyone else that’s affiliated (in anyway) with bringing this special event to our shores.